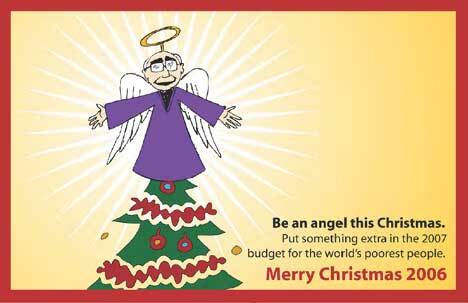 World Vision Australia is encouraging politicians to get into the giving spirit of Christmas this year with a set of humorous Christmas ecards. 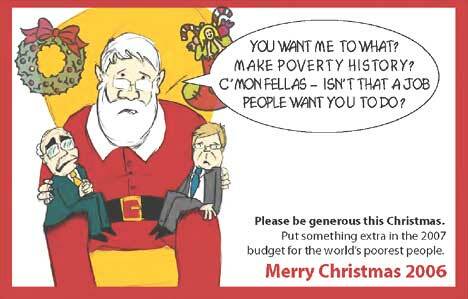 Members of the public are invited to send the cards to the local MPS asking them to help Make Poverty History as they plan for the coming year and finalise the 2007 federal budget. The Make Poverty History campaign calls for more and better aid, debt relief and fair trade. 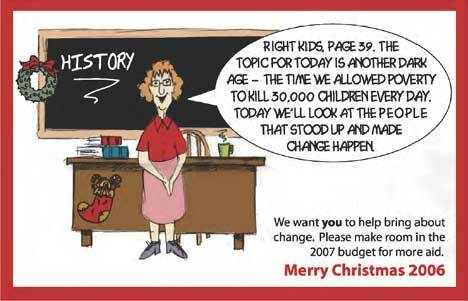 ‘History Lesson’ refers to the dark age in which we allowed 30,000 children to die every day. Students are introduced to the people who stood up and made change happen. ‘Santa’ has John Howard (Prime Minister) and Kevin Rudd (Leader of the Opposition) sitting on Santa’s knee.